The world economy and trade started to pick up from the beginning of this year and China’s economy maintained the momentum for steady progress, said the official, adding that it has provided strong support for China’s foreign trade growth. China’s imports and exports went up 8.6 percent year-on-year to 16.72 trillion yuan ($2.45 trillion) in the first seven months of this year, the official with Ministry of Commerce (MOFCOM) announced Tuesday quoting customs data. 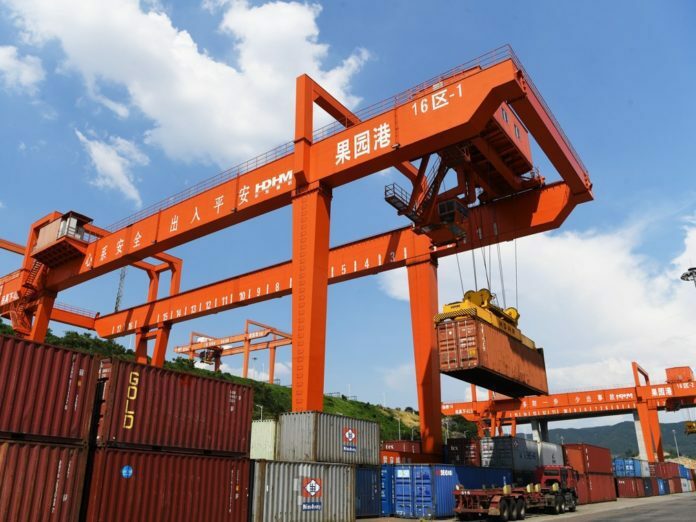 Exports grew 5 percent over the same period of last year to 8.89 trillion yuan while imports was up 12.9 percent to 7.83 trillion yuan, resulting in a trade surplus of 1.07 trillion yuan which narrowed by 30.6 percent. In July, China’s goods trade registered 2.6 trillion yuan, seeing a growth of 12.5 percent. China is witnessing a fast growth of imports and exports in 2018 with persistent structural optimization, accelerated shift of driving forces and enhanced quality and economic returns, said the official with Department of Foreign Trade under the MOFCOM, adding that the country has secured a stable performance and consolidated the good momentum for growth. From January to July, China’s imports and exports reached 16.72 trillion yuan, hitting a record high over the same period in history. From a global perspective, China’s growth rate on imports and exports in the first half year was 3.8 percentage points higher than the average of major economies, according to the latest statistics released by the World Trade Organization on 30 major economies. Thanks to its efforts to diversify choices on international market, China has further optimized its foreign trade structure. It achieved rapid growth in imports and exports with emerging markets while consolidating its status on traditional markets such as the US, Europe and Japan. The country’s trade with BRICS members and Belt and Road countries respectively grew by 12.4 and 11.3 percent. Besides, China also further balanced the domestic picture of imports and exports, with central and western part seeing a 15-percent growth in foreign trade, which was 6.4 percentage points higher than the overall growth. Trade volume of the region accounted for 15.6 percent of the total cargos traded, up 0.9 percentage points. In addition, the commodity structure was also optimized. The country exported 6.8 percent more of electrical and mechanical products in the first 7 months than the same period of last year. Its share in the overall exports amounted to 58.3 percent, 1.0 percentage points higher than a year ago. The export of automobiles, mobile phones, and computers respectively grew by 17.9, 8.9 and 5.2 percent from a year ago. Various business entities are bracing for common development. Private sector remained the largest exporter, with a growth of 7.6 percent. The sector’s export volume accounted for 47.7 percent of the country’s total, 1.2 percentage points higher from a year ago. Moreover, thanks to the improved trade mode, general goods trade rose by 12.7 percent and its proportion increased by 2.1 percentage points to 58.9 percent. China accelerated the shift of driving forces for foreign trade. Due to the continuously improving environment of new business forms, the country’s cross-border e-commerce and procurement kept rising for the third year in a row, marking a new highlight for foreign trade growth. Through independent innovation and improving branding capabilities, foreign trade enterprises have gradually bolstered its internal power for growth. The quality and economic returns of foreign trade have been further enhanced thanks to the improved quality, class and added values of exported commodities. In the first seven months of this year, electrical and mechanical products such as computers and engines have seen increased added value, with unit prices rising by 11.7 and 6.8 percent respectively. Foreign trade contributed more to the national economic and social development. In the first half of 2018, China’s tax revenue from imported goods was up 8.9 percent from a year ago to 997.4 billion yuan, accounting for 10.9 percent of the country’s total taxation income. The official vowed that the MOFCOM will make great efforts to cultivate new business forms for trade, promote innovation-driven development of processing trade, and adopt more proactive import policies. It will also make full preparation for the first China International Import Expo, further enhance trade facilitation, promote high-quality development of foreign trade, and boost China’s trade strength, so as to make more contribution to national economic and social development, the official added.